The remains of two Ice Age infants, buried more than 11,000 years ago at a site in Alaska, represent the youngest human remains ever found in northern North America, according to a new paper published in the Proceedings of the National Academy of Sciences. 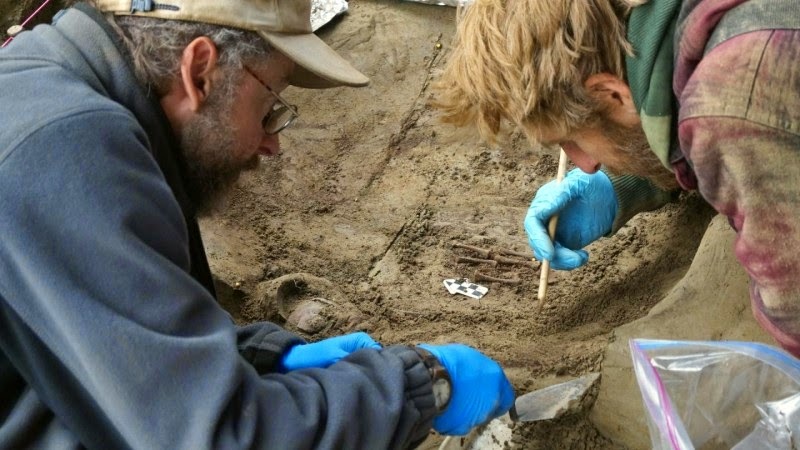 The site and its artifacts provide new insights into funeral practices and other rarely preserved aspects of life among people who inhabited the area thousands of years ago, according to Ben Potter, a researcher at the University of Alaska Fairbanks and the paper’s lead author. In the paper, Potter and his colleagues describe unearthing the remains of the two children in a burial pit under a residential structure about 15 inches below the level of the 2010 find. The radiocarbon dates of the newly discovered remains are identical to those of the previous find–about 11,500 years ago–indicating a short period of time between the burial and cremation, perhaps a single season. “The presence of hafted points may reflect the importance of hunting implements in the burial ceremony and with the population as whole,” the paper notes. The artifacts–including the projectile points, plant and animal remains–may also help to build a more complete picture of early human societies and how they were structured and survived climate changes at the end of the last great Ice Age. The presence of two burial events–the buried infants and cremated child–within the same dwelling could also indicate relatively longer-term residential occupation of the site than previously expected. “The deaths occurred during the summer, a time period when regional resource abundance and diversity was high and nutritional stress should be low, suggesting higher levels of mortality than may be expected give our current understanding” of survival strategies of the period, the authors write. Note : The above story is based on materials provided by University of Alaska Fairbanks. The original article was written by Marmian Grimes.